It is difficult to imagine or remember now what an exciting breakthrough pocket calculators were. This was in the days before computers of any kind, let alone personal ones, were available to the public. There really was no way of accurately calculating, say 3834534/34582. The most common approximation was to use tables - booklets full of pre-calculated logarithms and trancendental functions. That would give you about four digits of accuracy (five figure tables were too much trouble to use). If you learned how to use one, a slide-rule was quicker, but was really only accurate to two or three digits. Mechanical calculating machines, where available, were basically expensive adding machines. Multiplication was a case of repeated addition with much handle cranking, possibly even motor-driven. For division it started to get silly, winding a handle until a bell rang, change some settings and repeat until the calculation is complete. As for long division, I don't think I have ever used this in a calculation which was not for the purpose of learning long division. Does anyone have a calculator? The pocket calculator meant freedom. It was a warrant for release from the drudgery of longhand arithmetic and its associated tedium and uncertain accuracy; effective immediately. It gave the answer with no effort, almost instantly, and with more digits of precision than you knew what to do with. The early models had a noticeable delay and would visibly cause their displays to flicker as the more complex calculations progressed. This gave an even more acute sense of the arithmetic power one was unleashing on the problem at hand. In the space of a few years, a tiny box in your hand was able to do the work of ranks of clerks with mechanical calculators. Surely no piece of technology has had such a profound effect in so short a space of time - not even the PC. 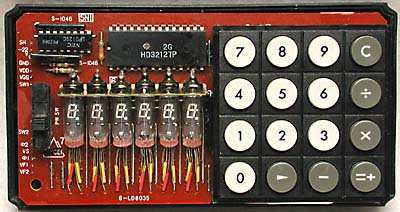 In 1965, Texas Instruments, who had recently developed the first integrated circuits, needed an application to demonstrate their advantages in miniaturising complex electronics, and so started development of the "CalTech" prototype pocket calculator. The completed prototype was demonstrated two years later, and it spurred a number of companies to produce commercial devices, mostly using chips manufactured by TI, long before TI themselves became a manufacturer of calculators for end-users. The early devices printed their results onto paper tape. That's when was born the world's first pocket calculator; The Casio Mini . It was ten years between the world's first and a schoolboy's first. That didn't happen with television, or CD, or any other major consumer technology I can think of. By now there had been an explosion of calculator brands. Nowadays only Casio, Canon, Sharp, TI and HP survive as mass producers of pocket calculators. The choice was an important one, and it was a big day when I finally went to buy one. For me, it was about the equivalent of choosing a car today. The Casio Mini calculator was a very simple four function calculator with a large flourescent six digit display. An unusual feature was that the six digit display could be doubled up to show a further six digits for certain calculations (this feature did not work for division). Since there was no scientific notation, this was needed to compute the product of two relatively large numbers. Like most Casio calculators of the era, it had a horizontal layout. The zero only used the bottom four segments of the display, presumably to distinguish it from the digit eight. If you tried to divide a number by zero, the extra digits could be seen to be incrementing rapidly. This was a popular experiment amongst schoolboy calculator owners and quite a number of calculators of the day behaved in this way. It was rumoured that this damaged the calculator. As unlikely as this seemed, it was a horrifying thought that you might be endangering the most valuable piece of equipment you owned. At first, when only the lucky few had them, calculators were forbidden in examinations. When at last they were permitted, the invigilators would examine them with suspicion. They were checked to see they held no secret messages or "cribs", and that their capabilities did not make the mathematics too easy. In those days the examination was primarily a test of your ability to memorise facts and write them down against the clock; and to some extent they still are. Within a couple of years, the price of scientific calculators had dropped to about £20 in the UK and it was time to get rid of the four-figure tables for good. I bought a Commodore SR7919 which had an LED display and on which every button had a multitude of functions. The buttons had a very satisfactory "feel" for about a couple of years, until they started sticking (presumably this had nothing to do with the coffee spill). By that time prices had dropped further and the specifications had improved and it was time to buy another. By 1971, a large number of manufacturers were producing calculators with LED displays, using chips manufactured by TI or the newcomer Intel. Intel's offering was actually the forerunner of the series of microprocessors used in most PCs today. The early models were expensive, but as large numbers of companies saw the size of the potential market, there began one of the most spectacular price wars in the short history of high technology. In two years, the cost of these devices had dropped by an order of magnitude. By 1974 a four function calculator could be bought for $30 (or £30 - for some reason the transatlantic technology premium always seems to track the dollar/Sterling exchange rate). The following year prices had halved again, and school students suddenly were able to afford them. The Commodore's replacement, a Casio FX-31 had certain similarities to the Casio Mini, with a green flourescent display and a similar feel to the substantial looking buttons. I still use this calculator today - two decades have perhaps shown relatively little improvement in either size or additional useful functionality. The display is brighter and easier to use than LCD models. The only problem is the battery life - which is why I accumulated about half a dozen LCD Casio's through the final two decades of the last millenium. Now pocket calculators are more powerful and less expensive than ever. Advances include low-cost programmables with large amounts of memory, and graphing calculators. Many basic models also now include a multi-line display so that you can compose and edit an expression for evaluation. And at the low end, there are simple calculators so tiny that they fit on keyrings. Despite these advances, nothing matches the revolution in numerical computation which occurred in the seventies, during which tables, slide rules (and nixie tubes if you were the lucky) were replaced by pocket calculators that everyone could afford. If progress had continued through the 80's and 90's at the same pace we might have expected that in the early 90's laptop computers would be an eighth of an inch thick and slip into your shirt pocket and have a broadband wireless connection to the internet. Now it looks as though that is starting to happen. Distinctive features: Low-cost hand-held calculator. Does not have a decimal point key. Display is 6 digits, green fluorescent, individual tubes. 4-function, decimal point fixed at the far right of the display. Another 6 less significant digits are revealed by pressing the right-arrow key, as demonstrated below. Integrated circuits - Hitachi HD32127P & NEC uPD129C, here date coded 1972. 148 x 75 x 42 mm (6.1" x 3.1" x 1.3"). Introduced August 1972. Price in U.S.A. in November 1972 was US$59.95. Casio Computer Co., Ltd., Made in Japan. Inside the Casio Mini, revealing the six miniature fluorescent display tubes. 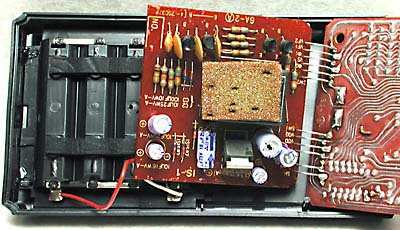 The power supply board, underneath the main circuit board, which produces the higher voltages for the fluorescent display tubes. 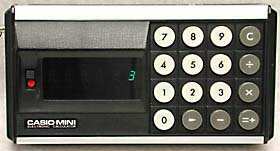 The Casio Mini has no floating point and lacks a decimal point key, so you cannot enter numbers with decimal points. However it can display the digits to the right of the decimal point as shown above. Here 22 has been divided by 7 to give an approximation to PI. The display shows 3, but by pressing the right-arrow key the digits to the right of the decimal point can be seen, 142857, giving the complete answer 3.142857. 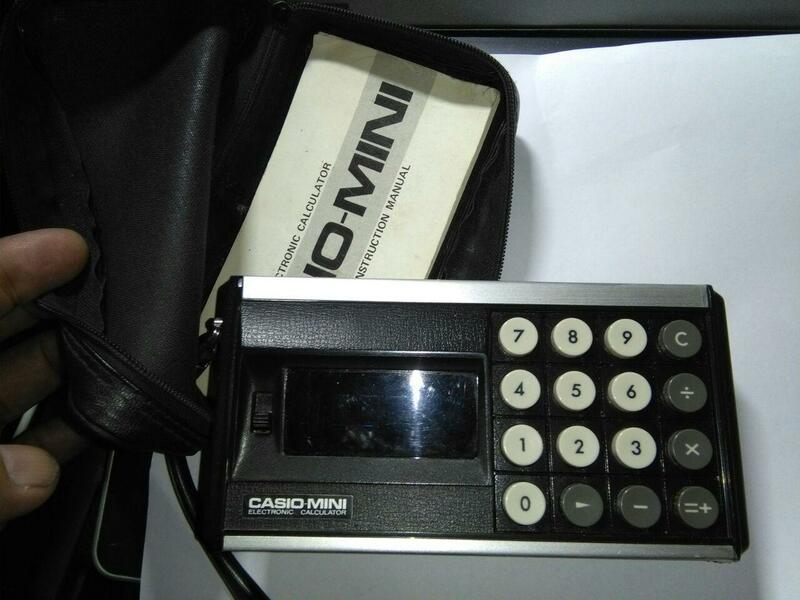 When introduced in August 1972 the Casio Mini had a very low and competitive price, below US$100.00 [£40.00 Sterling]. This was achieved by limiting the display to 6 digits, using fluorescent tubes (then cheaper than LED displays), and manufacturing in very large volumes. It was thought that most Japanese users would use the calculator for currency calculations and would be happy with a calculator that could calculate with whole numbers to ¥999,999. The quality is much better than that of the similarly priced Rapidman 800. The Mini was updated several times over the next few years (with added model number on the back) as the CM-601 to CM-605, all with a similar horizontal layout, and lower prices. These were followed by the similar Personal Mini models (CM-606 & CM-607). Due to its low cost this calculator family sold extremely well and fuelled the calculator price war in this period. "$60 calculator", Popular Science, November 1972, p107.